Author of "Start With Why"
Simon Sinek teaches leaders and companies how to inspire people. He is leading a movement to find, celebrate and encourage the next generation of great leaders. He writes, consults and speaks all over the world about the concept of Why - the purpose, cause or belief that drives every one of us. Having a clear sense of Why is the one common factor that all great leaders, those able to inspire those around them, possess. A trained ethnographer, Simon has a lifelong curiosity for why people and organizations do the things they do. Studying the leaders and companies that make the greatest impact in the world and achieve a more lasting success than others, he discovered the formula that explains how they do it. The amazingly simple idea, the Golden Circle, is grounded in the biology of human decision-making and is changing how leaders and companies think and act. 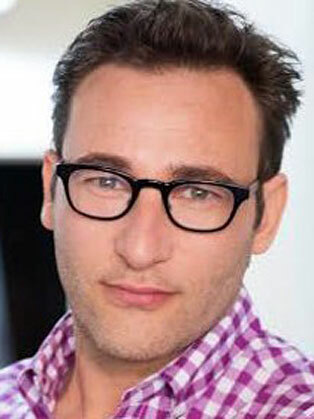 Sinek's unconventional and innovative views on business and leadership have attracted international attention and have earned him invitations to meet with leaders and organizations in a wide array of industries including Microsoft, Mars, 3M, New York City Ballet, the United States Military, Members of the United States Congress, the Ambassadors of Bahrain and Iraq, multiple government agencies and entrepreneurs. Sinek has also had the honour of presenting his ideas at the United Nations, to the senior leadership of the United States Air Force and to the senior leaders of NASA. Simon shares his optimism with all who will listen. He speaks at conventions and corporate gatherings around the globe including events organized by Forbes Magazine, American Express and PSFK, a leading trending spotting organization. He also comments regularly for local and national press, including The New York Times, Wall Street Journal, The Washington Post, Houston Chronicle, Forbes, FastCompany, CMO Magazine, BusinessWeek and NPR. He is a regular contributor to The HuffingtonPost and BrandWeek and makes regular guest appearances on MSNBC's Your Business, among others. Simon is active in the not-for-profit world, where he works with various arts organizations, The Abraham Path and the EFE Foundation, an organization devoted to creating opportunities for youth across the Middle East region. His book, Start With Why, How Great Leaders Inspire Everyone to Take Action, published by Penguin Books, was voted one of the best leadership books of 2009. When not staying in hotels, Simon lives in New York where he also teaches graduate level strategic communications at Columbia University. Everything Simon does is designed to inspire people to do the things that inspire them.